Most guys take up the guitar so they can have women. Robert Brown took up guitar because he wanted to have women (and everyone else within earshot) fall asleep. Brown's Northern Valentine, the Philadelphia based Ambient drone outfit, creates a perpetual state of atmosphere and shows new depth on their CD Fin de Siécle (45'47"). 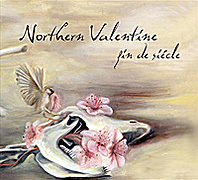 Using guitars, synthesizers and an interesting variety of instruments and players Northern Valentine seeks to capture not surface reality but some more intangible psychological state of being. Listeners to their music are more dream interpreter than audience member as these works seem less like mere songs and more like a portal to a dimensionless landscape. Progressing at a pace that can only be called sedate each track on Fin de Siécle transforms the raw material of e-bow guitar, textural synth washes and breathing bass swells into a distinctive slowly-lowly-slow sonic poetry. 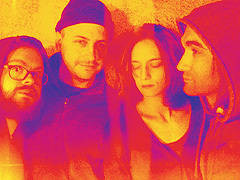 Yet mysteriously these tones pulse with living energy as the album moves between blissed out Elysium and blessed unrest. Reflective and seemingly without resolution, Northern Valentine's music is a form of exploration, of lighting out into the unknown and heading for those unmarked places on the map - while we listeners revel in this music's hypnotic thrall.